Lakemate – the professional open water venue management system. The Lakemate system tracks the status of swimmers at your venue to keep accurate records and reassure your members that their safety is of paramount importance. Lakemate comprises of coded RFID bands, scanner and PC software, even use PoolMatePlus watches and get swim stats too. Present the band to the scanner and scan in, swimmers name is spoken and details appear on your screen. Scan out and have the assurance that the swimmer is no longer in the water. Always know who’s in the water and how long they have been in. Emergency contact details and medical information at a glance. Import from online registration form or csv file. 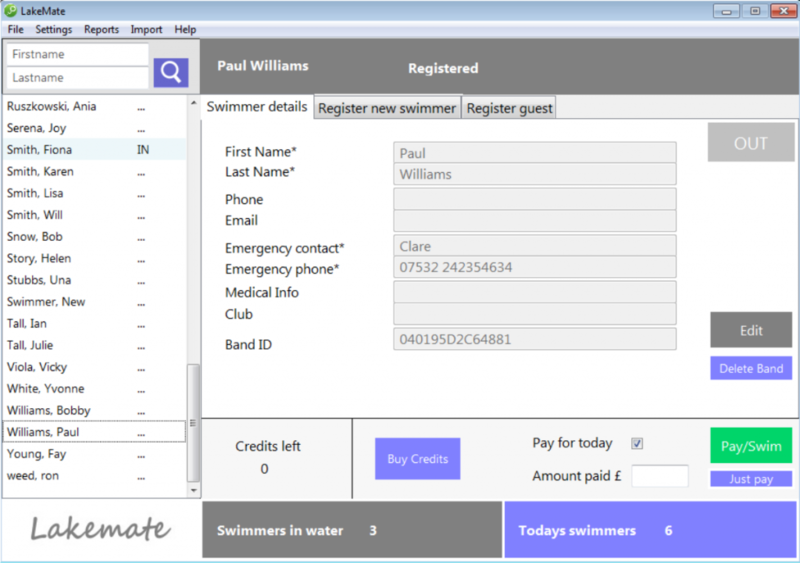 Simple to use – Each swimmer registers by entering their contact details (either at the venue or online) and then purchases a band. The swimmer scans the band on entry to the venue, pays, then scans on exit (OUT). Credits can be loaded if the swimmer prepays for a block of swims, these will automatically be deducted each time a swimmer scans in. Data is stored locally on a Windows machine for quick and easy access. An internet connection is not needed and there are no concerns to swimmer about their data being shared with others. Guest mode for quick one time use. Manual scan mode for overriding the swimmer’s OUT status by hand. See who is in the water and the time they entered. See who has swum today, time in and out and duration. Scan to check the swimmers details, or how many credits they have left, and pay for session without changing swim status. Easy edit to change swimmers details/reissue a band/issue a guest band. See seasons history at a glance (table and chart), number of swimmers per session, total swims that year. Export to csv file too. Export email addresses for mailing list. Automatically backs up database at the end of each session, additional manual backup any time. See daily takings summary for cashing up purposes. Lakemate has been designed to solve the problems with existing venue management systems. It’s very simple to get started, plug in the scanner and install our software and you are up and running. We will support you as needed, help import existing members or give operator training. Lakemate really has been designed to be very simple and easy for anyone to use. It’s great value for money too, no annual fees for swimmers to pay. We have a package for any size of venue, whether you have 50 swimmers or 50,000 we have a solution for you. Please email info@swimovate.com for our best pricing. Lakemate can also be used along side other systems too. If you have a system you are happy with already that is great. Perhaps you’d like a quick and safe way to handle your guest swimmers though, Lakemate is ideal for this and much quicker than existing platforms. After all, swimmers want to swim, not queue.